Bicep Curls And Kettlebells: Don't Curl In The Squat Rack! Most gireviks will give you the look and grunt if you mention bicep curl and kettlebell in one sentence. If you’re real lucky, you’ll be able to walk away without getting a kettle ball thrown at you! But, that doesn’t mean you can’t work the biceps with a kettlebell, perhaps you don’t have the money, perhaps you’re designing a complex in which you don’t want to put the weight down and grab another tool to continue the job, perhaps it’s for different reason. Whatever the reason is, don’t pay any attention to those that grunt at you when you say “kettlebell and bicep curl”. I’ve recently been experimenting by looking for some technique and positions that hit the biceps, and it turns out that something that really translates well to kettlebell training is the answer to hitting those biceps. It’s the slow-motion clean! It’s just like a swing clean, but without the swing and explosiveness. You’ll need some time to get used to the turning of the hand and focus on getting a good hand insert, it also requires pronation of the forearms. I’ve started to add some more bicep work to my kettlebell workouts because I feel it’s such an overlooked area within Kettlebell Training, all because of the stigma associated with it. If you plan it right and have correct form and technique the kettlebell can actually be a great tool to work the biceps brachii and brachialis. I have been doing dead curls in particular, the reason I like dead curls is because I want to avoid any tendon issues, which I believe can quite quickly be experienced if they stay under constant tension and making moves in angles they’re not used too. The dead part in the curl allow them to have a split second of muscle relaxation. Tell me, what do you curl with? 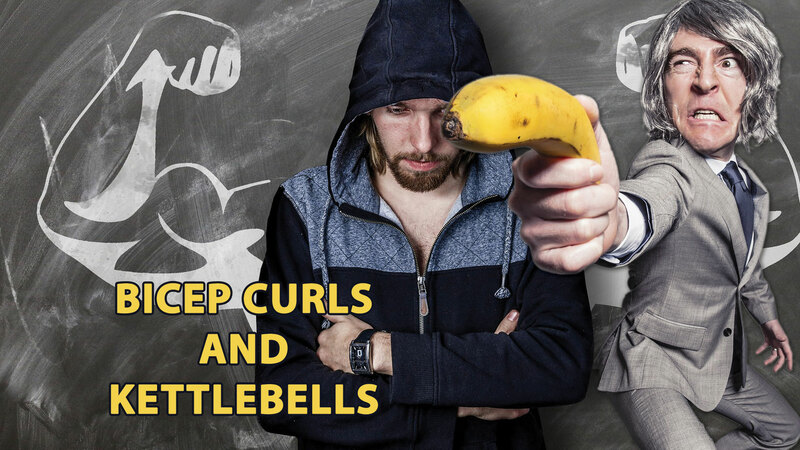 Will you grunt at me if I curl with the kettlebell? Your feedback below or on this Facebook post. If you like to bicep curl with the kettlebell, thumbs up below. PS. fun fact, did you know that your biceps are not the prime mover in elbow flexion? It’s actually your Brachialis.